Dr. Ihsan Kaadan always wanted to be a doctor. Growing up in Aleppo, Syria, he took inspiration from his father, a surgeon, and from the prospect of saving lives. After starting medical school at the University of Aleppo in 2006, he volunteered with the Red Crescent and attended medical conferences outside Syria. He found himself drawn to internal medicine, rather than surgery. As civil uprisings that started in Syria in 2011 deteriorated into civil war, Aleppo became a battleground between the Syrian government and opposition forces. Still, Kaadan graduated from medical school in 2012. He began working at Aleppo University Hospital, treating injured civilians. As a medical student, Kaadan had studied the effects of various environmental pollutants on the human body. One day, he found himself treating patients who had been attacked with chemical weapons, he wrote in a recent personal essay for STAT News. But Kaadan was lucky. He had a valid visa to the U.S. from having attended a conference in 2012. His father urged him to leave Syria. In 2014, he passed, to the sound of bullets, through one of the most dangerous sections of Aleppo and fled for Turkey. From there, he flew to the U.S. Were he to attempt the same today, Kaadan might not be so fortunate in entering the country where he now works. In late January, President Donald Trump issued an executive order banning immigrants from seven majority-Muslim countries, including Syria, from entering the U.S. for 90 days. A federal district judge subsequently blocked key parts of the ban, and a federal appeals panel on Thursday upheld the judge's decision. What will ultimately happen with the ban—and how that will affect the tens of thousands of people to which it applied—remains uncertain. After several months in the U.S., Kaadan received a scholarship from the Open Society Foundation to earn a master's degree in international health policy and management at Brandeis University in Massachusetts. 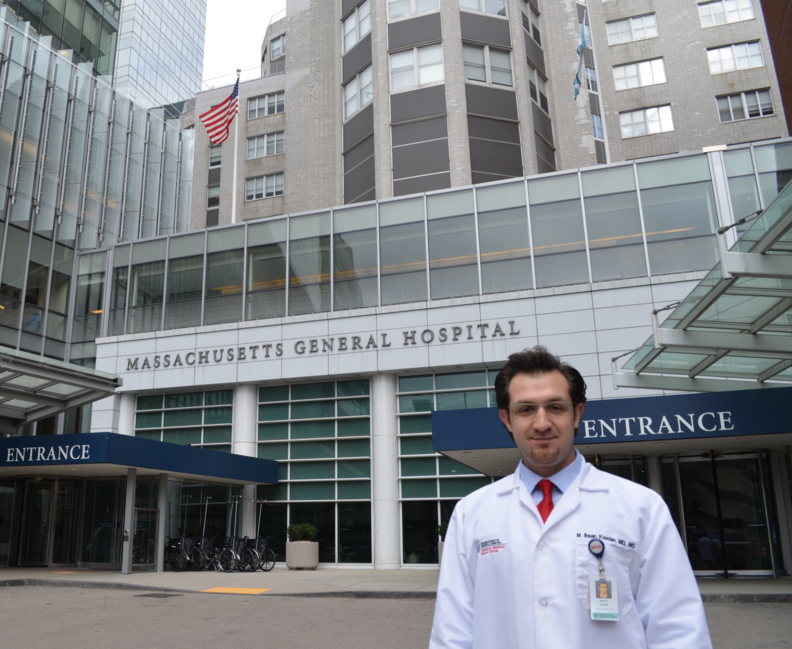 His new status as a student qualified him for a different visa, the J-1, and, eventually, Massachusetts General Hospital hired Kaadan to do clinical research in cardiology. Now, Kaadan works on research into cardiac arrhythmia that he could not do in Syria, he said. On the side, he was also part of a team that invented an award-winning automatic larvicide dispenser for residential water tanks. The team is now working on patenting the device. But what Kaadan really longs to do is return to Syria. By late 2016, fewer than 30 doctors were estimated to remain in his home city of Aleppo. Government airstrikes target hospitals. The city, once home to 2 million, had about 300,000 people under siege in its eastern, rebel-held half. Kaadan envisions someday rebuilding the health system there. He knows that's a long-term vision—“at least 12 or 15 years from now,” he said—given the ongoing war. But even before then, he can see himself contributing remotely to efforts to rebuild the health system there. First, he hopes to complete his residency in internal medicine in the U.S. He said he'll apply in the fall for programs, and he is eyeing those that offer a global health component. “I'm planning to get the skills I need to go back to Syria and contribute,” he said. Now the immigration ban has created uncertainty for Kaadan and thousands of other physicians, researchers and healthcare workers from the seven countries who need visas to continue working, studying and researching in the U.S.